Note: The rakeback you get will be lower if you play tighter than average and higher if your play is looser. How can an FPP calculator improve my game? 1. 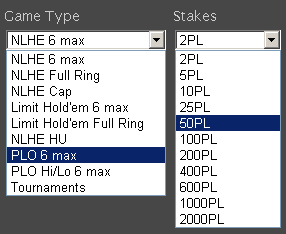 Use the drop down menus to select your game type and stake level, e.g. $0.25/$0.50 6m PLO. For MTT / SNG players, enter your average buy-in amount in dollars. 2. Enter your hands/day, or for tournament play, the number of games you play per day. 3. Click ‘Advanced Options’ to input your current VIP level and VIP Player Point (VPP) count, plus the starting date you’d like to project your rakeback rewards from. 4. Hit ‘Calculate’ and the PokerStars rake calculator will display the rakeback percentage you’ll achieve after earning the annual rakeback and number of FPPs shown. Your year-end VIP status and FPP value at that level is also shown. 5. Hover your mouse over the graph to display your rakeback percentage and cumulative rewards as of each month. Click ‘Next year’ to see how your efforts will pay off even more so later – your rakeback % starts higher due to having a higher FPP multiplier from the beginning, as your VIP status carries over into the next year. Using the VIP calculator PokerStars players of all kinds can benefit. Player A is hoping to make SNE in the next calendar year at 100NL Zoom. Four-tabling the Zoom pool they can grind 1000 hands/hour. A little over eight hours of play per day yields them a near six figure salary from rakeback alone. Mixing in extra tables of 200NL or 500NL would make the daily schedule more manageable. Player B is mid-way through the year and after a slow start on the Supernova run has 25,000 VPPs. To reach their target by new year’s day, they need to play 2,300 hands per day of their regular game, $1/$2 6m LHE. Player C is a head-up regular who plays across multiple sites to get action. They’re just concerned with the minimum volume required to keep Platinum VIP status and 26.4% rakeback each month, rather than pursuing annual goals. They need to aim for a little over 40,000 hands/month. Player D receives a WCOOP reload bonus of $30, and must earn 600 VPPs to clear it all. Playing micro stakes PLO, their VIP status is Bronze and 1 VPP = 1 FPP. To clear the bonus within 30 days requires approximately 18,500 hands and provides a large additional rakeback boost on top of the $7/month from FPPs alone. Player D now decides to move up to 5PLO. Staying at this level for a year, they’ll earn over $40/month in rewards, and more than double their rakeback % with the same daily volume. As a Silver VIP, they can buy $25 bonuses in the VIP store, which offer a higher value for money ($0.011/FPP) than Bronze $10 bonuses ($0.01/FPP). 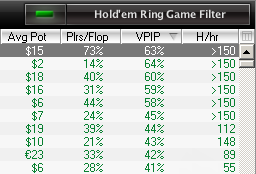 Forecasts made with the Rakeback PokerStars Calculator are accurate for the average player. If you play 10% tighter than average (which is a good approximation for solid, winning TAGs), then you may need to play 10% more hands to achieve the same rewards. To check this, go to the PokerStars lobby where you can see the VPIP (voluntarily put money into the pot) numbers for each table. If your VPIP is lower than the table averages you see in the lobby, then you are tighter than average, and vice versa. The exchange rate that we have used to convert FPPs to USD ($) for our poker rake calculator is based on the typical exchange rate which players at each VIP level achieve. Lower VIP levels can achieve a higher exchange rate and higher rakeback if FPP points are exchanged for max value. The Pokerstars Rakeback Calculator is based on data from over 80 million real-money hands played at the industry-leading room. PokerStars has one of the most profitable and complex VIP programs of any poker site because there are so many forms of rewards, including FPPs, freerolls & milestone bonuses. Jump to the VIP Calculator to see how much you could earn.